Yhis may have been on either Silk’s farm at the top of Whitwell Way or possibly Clarke’s farm which was at the other end of the village beyond the church and almost oposite the smthy. Would be great if anyone has any photos of the smithy. It is probably at Clark’s farm as George says. It is a threshing machine powered by a flat belt drive from a power take off from a tractor, or possibly a traction engine, parked off shot to the right of the photo. The sheaves of wheat or barley were fed into the top of the machine which “threshed” the corn separating the grain from the straw. The grain was bagged off into hessian sacks which, when full, were taken away by sack barrow. It pre dates combine harvesters and baling machines. I can remember, as a young child living on Silverdale Avenue, the wheat field beyond our back garden being harvested and the sheaves of corn being set up into stooks which were then collected by tractor and trailer for taking to the threshing machine. There used to be a grain storage barn next to the white gate at the end of Whitwell way and there was certainly a threshing machine used there. It was on farmer Frank Sadler’s farm land I believe. 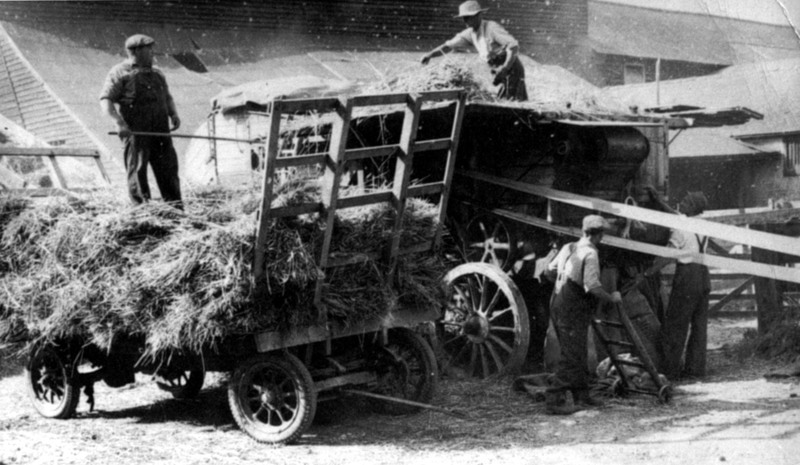 The threshing machine is on Whitwell farm I think the man on the trailer is Mr Charlie Richmond ,and the farm was run by my father Horace silk.